Not so long ago Toshiba bought one of the oldest memory related (RAM, SSD) and end consumer cherished company in this industry – OCZ. This partnership was necessary for OCZ as they couldn’t keep up with the profit margins of the big memory brands and make the company sustainable since they didn’t manufacture the flash chips themselves. This is where Toshiba came in and offered in a way a helping hand. I say in a way because I feel like the OCZ brand is slowly being swallowed by the gigantic moment a company like Toshiba, and it seems like it’s being pushed in the second plan. Putting that aside, having R&D, logistics and manufacturing departments the like of Toshiba, made possible for OCZ to make models like the one which I have today – Toshiba RC100. This is OCZ’s version of a more affordable, but still fast, NVMe M.2 SSD. They were for now pretty much reserved only for high-end, more expensive models, but it seems that everything is slowly scaling down to mainstream consumers. As I said, with this model, Toshiba and OCZ are trying to bring that high-end performance and throughput to the end consumer. Although Toshiba OCZ RC100 is an M.2 interface based drive, it doesn’t use SATA interface, but rather NVMe interface, which makes much faster from the get-go as NVMe uses PCI-express lanes for communication. Combining this type of hardware setup advantage, with the fact that it has up-to-date NAND flash chips and capable controller, results in one fast M.2 drive. But that’s not what’s most interesting about it, we already have fast NVMe M.2 SSD from before, that part of the market was well-established way before this model came. What’s interesting about it is that it offers all of that with being pretty close to those SATA 2.5 based SSD models price wise. It’s still not there yet, at least not in a way that you could say that they’re neck and neck in terms of the price, but we’re slowly getting there. And we all really want to see it there, cause it’s about time that we dethrone the SATA interface completely out of the picture, thank it for its (too) long service and move forward with faster interface options when it comes to mainstream. We could blame manufacturers for this state, they’ve tried to make SATA Express mainstream, but failed in that process realizing that 10 Gbit/s is not that much faster than what SATA III offers (6 Gbits), ditching it completely, though we didn’t have any SATA Express based products, to begin with, so in a way no harm, no foul, except for maybe teasing us, and now, we do have U.2 and M.2 interface (combined with NVMe protocol), but we’re still playing this guessing game, trying to see in which direction will it all go. I know, I’m ranting, but I had too, just a little bit, although I’m glad to see that at least with NVMe M.2 drives we’re going into the right direction price and performance wise. What’s on it hardware wise, we have a Toshiba’s in-house build unnamed controller and with no technical details, coupled with also Toshiba’s 64-layer 3D TLC NAND flash. There’s no presence of DRAM on it as it supports HMB caching technology which is supported with Windows 10 1709 build and which uses a small portion of your PC’s DRAM in order to execute its functions. For the interface we have an M.2 physical connection combined with the NVMe protocol and PCI-express bandwidth with x2 electrical configuration, which is a bit lower than we’re used to seeing on NVMe M.2 SSD, it’s usually x4, but I don’t think that will impact the drive’s performance. Since everything is squished inside of a single BGA package, you can see that we don’t have separate controller and NAND flash chips on the PCB itself, which is the reason why they could go lower with its price, but it also resulted in a single-sided M.2 module, which uses a less common 42 mm long PCB. This is overall a really compact form factor and it’s going to fit well in a notebook for example, as an upgrade solution for example, plus it also supports B + M key connection, so it’s versatile in terms of supported M.2 slots, but that’s also probably the reason why it has an x2 electrical configuration. Another restriction which comes from choosing Toshiba RC100 and inherently its form factor is the pretty limited maximal capacity. Since it’s a single-sided M.2 module in question, which is also a shorter 42 mm one, a not the more usual 80 mm one, the RC100 doesn’t offer any capacity larger than 480 GB, since they can not psychical populate it with more NAND flash chips, while mine here is the 240 GB one. But then again, it’s marketed as an entry level M.2 NVMe SSD, so anything above that probably won’t be appealing to users price wise. That’s pretty much it in terms of the more technical side of this model, and beside three-year warranty, there’s not that much to talk about, but to check out its the performance. Putting it through its paces using with my usual set of benchmarking tools, you can see that the RC100 indeed delivers well above your average performance compared to a plain 2,5” SATA drive. It ramps up to 1,6 GB/s of sequential read speeds and around 1 GB/s of sequential write speeds. That’s on point with the Toshiba’s claimed figures. Other than that, when it comes to other synthetics benchmarks, I was impressed with its results in the territory of read and write performance and IOPS figures at lower queue depths, being it full or empty, it’s even comparable with some high-end NVMe M.2 SSD’s, which says a lot. The full benchmarking results can be found in the video itself! 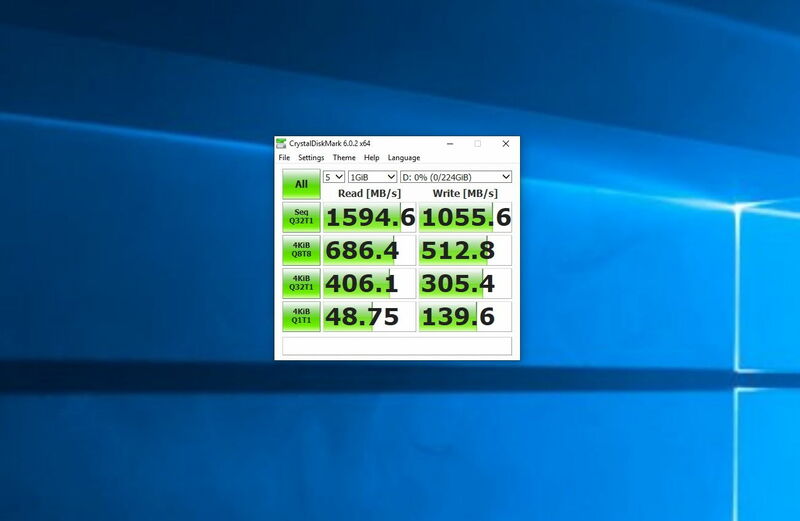 As you saw in the video, performance wise, I had no complains whatsoever, everything is so to speak fair and square in terms of this being a fast NVMe M.2 solid state drive. The only setback in my eyes is the fact that Toshiba OCZ RC100 doesn’t have larger capacities in the offer. Yes, it would be a bit pricier, but it still beats those really high-end models which put their price premium on a count of being really up there in their read and write speeds, but actually the difference in real-life day-to-day usage is negligible, as I’ve found out here in this NVMe vs SATA comparison. With all of this in mind, if you’re looking for an entry level NVMe M.2 solid state drive, this model is definitely a close contender for the first pick, although be sure to weigh in for your case the pros and cons of this type of drive versus a standard 2.5 SATA SSD (as shown in the video), cause you can still save a little bit of extra money with it if you really don’t need to know for what you will actually use that higher read / write speeds.